Lost Christmas occurred on December 24, 2029. That was the day a meteorite crashed into Japan, unleashing the Apocalypse Virus on Earth. In the wake of the devastation, a new totalitarian government sprang up, GHQ. The populace live under martial law, constantly reminded that their safety, not their liberty, is of paramount importance. As long as they do what they’re told, so say GHQ, the virus will be kept under control. 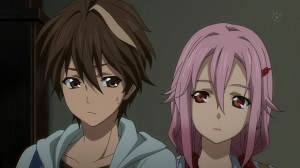 Guilty Crown is the ultimate teenage boy wish fulfilment. Ten years after the outbreak of the virus, high schooler Shu (Yûki Kaji) is walking home one day when he bumps into the gorgeous pop star, Inori (Ai Kayano). It turns out she’s so much more than that, however: she’s secretly been working for the Funeral Parlor, a terrorist organisation working to bring down GHQ. Through her, Shu learns that he has the power to retrieve and control voids – people’s souls turned into awesome weapons/tools. Whether it be a pair of pliers, shears or a giant, f*ck off sword, Shu has the ability to yank them out of people’s chests and take them into battle. Apart from being an unashamed wish fulfilment fantasy, Guilty Crown isn’t particularly original. The idea of voids is pretty cool, and enables the show to circumvent the awkward ‘why didn’t Voltron simply use his sword straight away?’ flaw that pops up in a lot of anime, but the rest is a hodgepodge of ideas we’ve seen before. The creators mention that one of their favourite shows was ‘Neon Genesis: Evangelion’, so its influence is all over here. Pop in some ‘Bubblegum Crisis’, some standard issue mechs, occasional awkward fan service and you’ve got an anime best of compilation. That being said, Guilty Crown is a bit of a…well, guilty pleasure. It’s just damn fun. Shu may occasional fall into the same bad habits of Shinji from the aforementioned ‘Evangelion’ – “I need to fight for what’s right!/No, I refuse to fight!/Okay fine, I’ll fight but I’m really angry now!” – but that just means it’s all the more exciting when he pulls out someone’s void and kicks some arse. To be fair, the story does explore some interesting ideas, foremost being the fact that the Funeral Parlor’s aims often seem just as sinister as GHQ’s. So for that reason, some of Shu’s hesitation makes sense. The animation is stunning and constantly impresses. There were no corners cut here, and it all looks fantastic on Blu-ray. Since one of the characters is a pop star, it actually makes sense when a song kicks in during a climactic scene, unlike some other anime, and the score is otherwise great. There are a good collection of characters, all which fall within pretty traditional genre tropes, and the voice acting is impressive. There are so many things that go unexplained in this first half of the series. The terrorists don’t seem at all concerned about concealing their identities, Inori walks around dressed like a superhero for no apparent reason, Shu’s mood oscillates wildly and his mum only ever appears in her underwear because reasons. But it’s all wrapped up in such a gleefully exciting and addictive package that it doesn’t really matter. Guilty Crown Collection One is available now on Blu-ray and DVD from Madman. This entry was posted in TV Series and tagged Action/Adventure, Anime, Disaster, Science Fiction, TV series by Stuart Wilson. Bookmark the permalink.